How to use Geoquery on another project with geofire real-time database in android? How to write a simple object to a shapefile using C++ and libshp? How can i store geographic files such as shapefile (.shp) in SQL Server database? How to render the data from .mvt or .vector.pbf file from scratch? I am using Leaflet.VectorGrid with Leaflet 1.3.1. I am loading GeoJson file to the plugin. It displays data on the map just on two zoom levels. Otherwise data just get disappear. I am attaching the video https://www.useloom.com/share/b889ef3b31f144a99738cfe4646bbb5c , where the problem can be seen on the demo example in Leaflet.VectorGrid project. I am new to leaflet and I am trying to filter different layers based on a geojson property via a checkbox. If the shelters is open it should show as green, if its closed it will show red. A user should be able to filter only for pet friendly shelters (yes or no). This is when the Show only pet friendly shelters is checked anything that is listed as pet friendly = no should be removed from the map. By default the map will show everything open, closed, pet friendly or not pet friendly shelters. I have different geojson that shows hospitals, users can decide to show near by hospitals on the map. I am having trouble getting the filters (via control.layers) to work. //Using a Layer Group to add/ remove data from the map. Default Map should show all shelters: petfriendly or not pet friendly and open (in green), closed (in red). If show hospitals is clicked it should show the hospitals along with the shelter information. When users click on "Show Pet Friendly Only" only those that are pet friendly should be displayed. When a user unclicks on "Show Pet Friendly Only" the default view should be displayed. This should happen regardless of the hospitals checkbox being checked. If I check show hospitals, it removes the shelter information. I'm trying to draw a circle on my Leaflet Map that should be always visible and centered even when user move or zoom in the map. The following code works well when user move the map, but when the user zoom in or zoom out, the size of the circle is not updated. I would like to keep always the same dimension for the circle. // Create circle that will be always visible and will have alwaus the same width. // Set circle always centered when map is moved. Where am I mistaken when adding a marker from geojson? I have a select2 option where a user can select a Continent, Region, Country, City or Airport. I integrated mapbox to add markers to the map on selecting a location. In case of Country and continent selection I would like to select the whole country/continent instead of just a marker. I tried using the Mapbox Geocoding API like https://api.mapbox.com/geocoding/v5/mapbox.places/germany.json?types=country&access_token=**** but I noticed it only returns a 'Point' coordinates. I would like to use a service where I provide the country/continent name and it returns a polygon with all the border coordinates in order to be able to highlight on the polygon on the map. Does mapbox have a built-in service for such functionality? Or do I need to use a third-party service or json file? shpopen.c:1629: SHPWriteObject: Assertion `nShapeId == -1 || (nShapeId >= 0 && nShapeId < psSHP->nRecords)' failed. grid is just a fancy wrapper around std::vector I wrote, it contains pointers to a Point struct with X, Y and Z coordinates. I have some shapefiles with extension (.shp) in my pc. But I know that any single shapefile is composed of three mandatory files which are .shp, .shx and .dbf. These files are what makes a shapefile be recognised as shapefile. I want to write some code in visual studio which enables me to browse computer location and locate such files and then if files are found I want to save them in a SQL Server database. How can I check if a selected file is truly a shapefile? And what code should I write so as to work with these geography data in SQL Server? I have heard that SQL Server supports Geography data. I have created windows form application and a button to browse the file. I expect that When the BtnSave is clicked the code should check if a file selected is a shapefile, and if true, the files should be saved to sql server else it should throw an exception that the selected file is not a shapefile. I want to generate a high-quality map image for print like https://mapsery.com/editor/. I use mapbox vector api for map tiles, but I don't know how to render tiles to image on backend. I tried to use mapbox-gl npm package but I can't run it in nodejs. How can I render map in nodejs? I signed up for the Mapbox vector tiles service and I've noticed that they provide map data in .mvt and .vector.pbf formats. Note that I want to do it from scratch , without using mapbox-js or Leaflet libraries. I use GeoServer to get line data stored in my database and display them in a web map application using Mapbox GL Js. For the line I use a SLD with a style of a simple line with a defined with and color. When I preview the layer, the lines are partly quite pixelated. 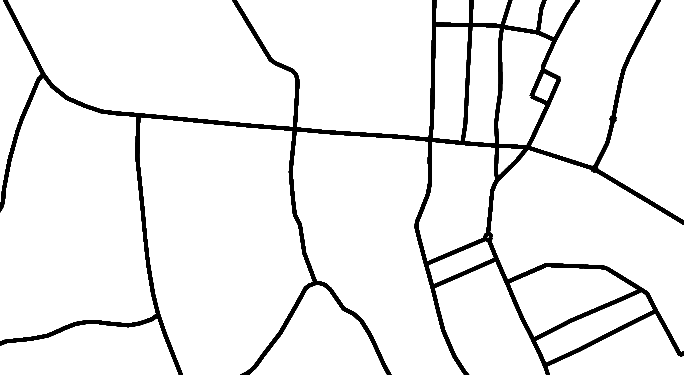 I serve the data als vector tiles, but already the preview in Open Layers shows the distortion. This is the outputted result. See the line from left to right, it shows terracing.